Stock volume performance upgrade for p/n 689-M68. Gerotor set assembled to an extended drive shaft that allows for additional support in the cover. 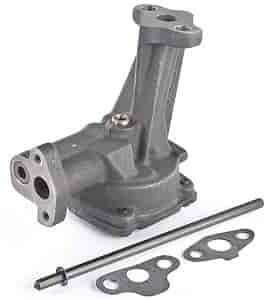 Supporting the drive shaft in both the housing and cover eliminates shaft deflection at higher RPM. Cover is doweled to the pump housing to assure alignment on the shaft bores. Housing and cover are CNC machined and phosphate coated for wear and rust protection. Relief valve has a pressure adjustable screw-in plug instead of a cup plug. Works with original 5/8" bolt-on pickup screen assemblies (not included). Does Melling 10687 fit your vehicle?